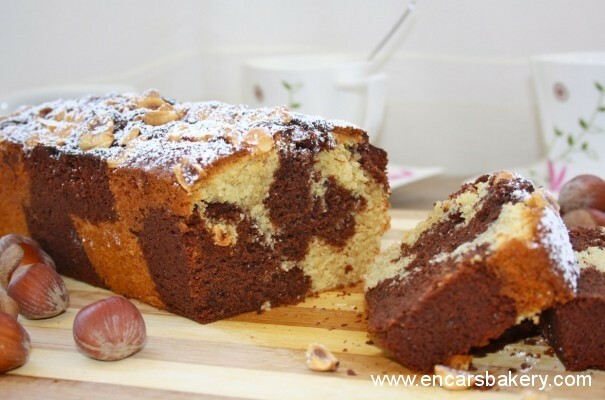 Today I propose a marble cake combines three fantastic flavors, vanilla, chocolate and hazelnuts, with a delicious result. Easy to prepare and very resultón for a snack from one of these cold evenings in which we both want to be home. We have just taken us, and tasted great. So do not wait any longer and I do story and how to prepare.. Prepare a plum cake mold 25 cm. long, smeared it with butter and sprinkle with flour. Basically put, also, a strip of parchment paper covering it, and above also apply butter and flour. We heat, water bath, 50 ml. milk, to which add the chopped chocolate to melt. Remove from heat and reserve. In a bowl, we beat the butter with sugar until fluffy. Add the eggs, one at, Continue beating while. Add to egg mixture over the sour cream into the milk that remains, and beat until combined. Sift the flour and add yeast and, little by little, to the mixture, stirring at all times, until it is fully integrated. Separate dough into two, party and we add the melted chocolate and mix. In the second part of dough we add the aroma of vanilla and mix. We took two tablespoons of the masses, alternatively, el and the plum cake molde, forming two layers of high. We spent a stick by the masses to mix slightly in different areas and the colors are a bit interleaved. 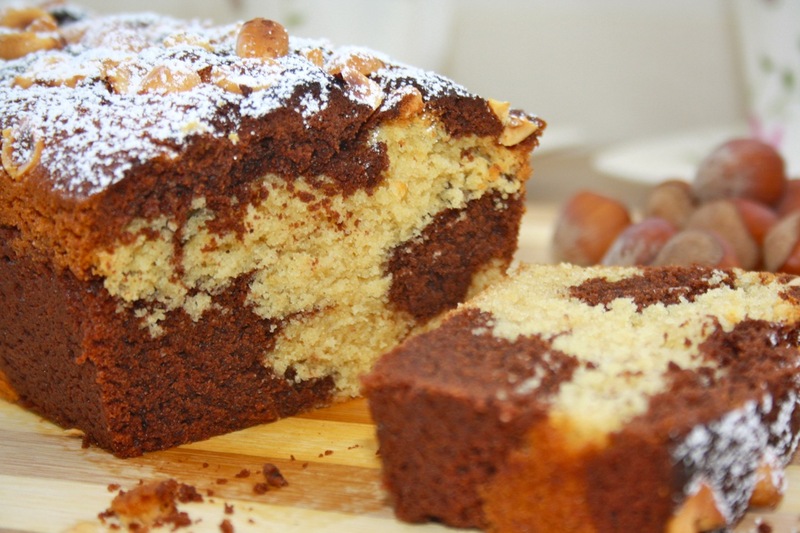 Chop the hazelnuts and placed on the surface of the cake. We put in the oven, preheated to 170 º C, during 50-55 minutes or until, to puncture the center of the cake with a stick, comes out clean. Once outside we let cool a few 15 minutes before unmolding. I sprinkle with icing sugar and .. To enjoy ! You see how easy it is to prepare a snack or breakfast fantastic !! I hope you liked the recipe, See you soon !! Ummmmmmmmmmmmmmmm, a little bit of that fabled cake sit me right now, Encar… We have been?. Ohhhh, So good ! !, I also want a Cachin, o dos, richer painting. That envy of snack, and here I am with a paltry churros. Kisses. Marbled cakes Ayyyyy I'm lost… but if it is carried Vellanad impossible for me to resist!! What good has to be! Arbor, I attest that has been ;), yes…not until! hello!!!!!!!!!! !,Incarnate's,as always a tentecion,I've done,but only plain vanilla,different nuts,unroasted,embuelto in the mix,and above,slight drizzle of cinnamon and a hug polvo.saludos. Thank you Irene, Arbor, Marten, David, Marmoset, Yolanda, Carlos (yes, we put the boots, hehehe .. from luegoooo), Natalia for your comments :). 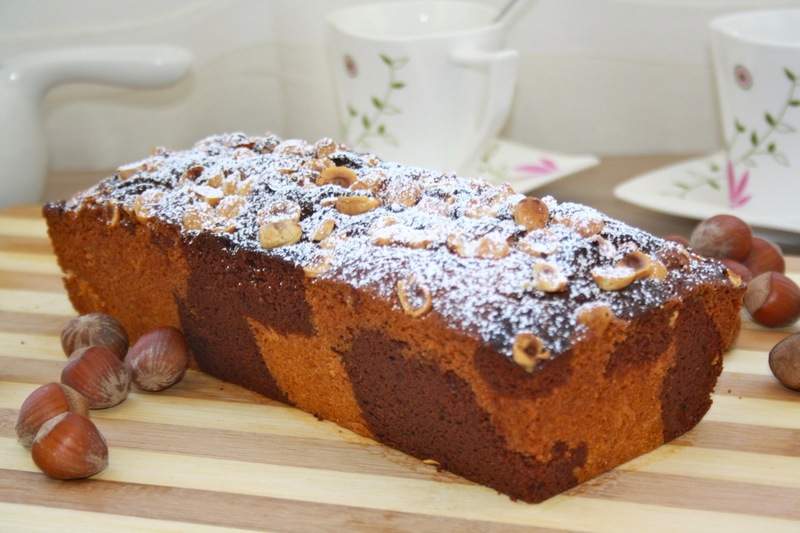 It is a very rich cake, worth doing, Is good, good ! I love this kind of biscuits Incarnate, so I print it now. A big kiss. But how beautiful you've stayed and certainly also riquisimo! A delicious cake, I love the blend of vanilla and chocolate. And the cakes are exquisite marbled. We have gone great. a kiss. At home we love this kind of candy for breakfast. Precious Quedou, both outside and in the court so beautiful you. The taste has to be divine! It is very nice and delicious pint!!! That delight, I love the combination is my favorite. I will one of these days, so I put it on slopes. This is one of biscuits i still being made to, I really like is the combination of the two colors. Painting is my God!!! I will try it, but one question, it is sour cream? where is achieved? a kiss. Simply delicious!!! I love I found you.. UN BESO!! Simply delicious!!!! I found you I love. UN BESO! !